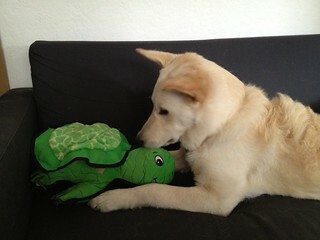 The Kyjen Plush Puppies Lil Rippers Turtle is one of the best toys that we have purchased. It is large for a dog toy, much larger than most of his other toys. The turtle has many more squeakers than we were expecting it to have. The top of the shell has several squeakers and the body has one in the head and one in each of the feet. When Balki plays with this toy, he stays interested in it for a long time. Balki loves that the shell is detachable. He rips the shell off as soon as I reattach it, and usually follows up with a swift head shake as if to say, "I did it!" At almost seven months old, he has started to chew through his toys more often. In a few days, he chewed through the body and removed squeakers from the head and two of the feet. However, the shell is still in good shape. He likes this toy so much that I don’t mind replacing it anyway. Kudos, Kyjen!